Welcome to my Virtual Quilt World! I actually finished this quilt back in July, but it is a gift, and I didn’t want to take the chance of them seeing it before it was Christmas. They dream of going to Africa. It’s been a long time in the making; I started cutting for the quilt while I was still with the Q8Quilters, in Kuwait, gathered all the fabrics and pieces in the ubiquitous plastic bin, and hauled them to Qatar and then to Pensacola for more cutting and ultimately the piecing. 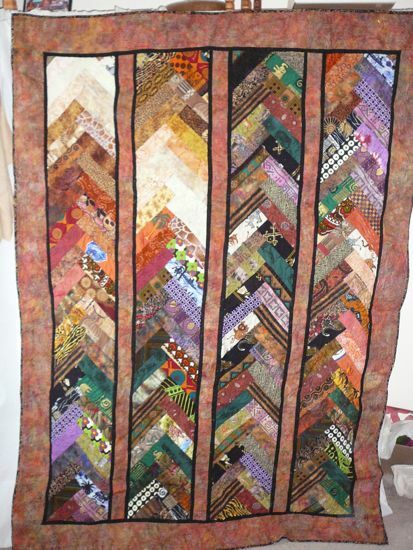 This is one of those quilts that was a lot of fun to work on because I loved the fabrics so much. Many of the fabrics are genuine fabrics I have found in Africa, have been given by people who lived in Africa, or were sold to me by Africans. Some batiks I found at a little shop in Edmonds, WA, where they sell objects made by African women as a means of supporting themselves. As I have less and less genuine African fabric left, the quilt pieces I use are smaller and smaller! I hate to waste a single fragment! 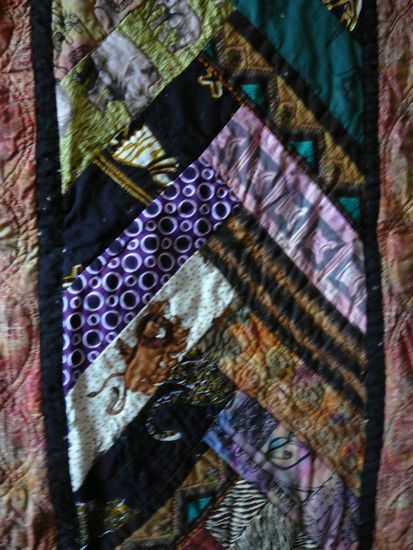 This entry was posted in 2011, Africa Quilts, Edmonds, Fabric selection, Great Quilt Shops, Kuwait, Machine pieced, Machine quilting, Pensacola. Lovely! Starch it heavily and try stay stitching the edges as soon as they are pieced. Or you could foundation piece it on lightweight muslin or paper–sort of like string piecing. 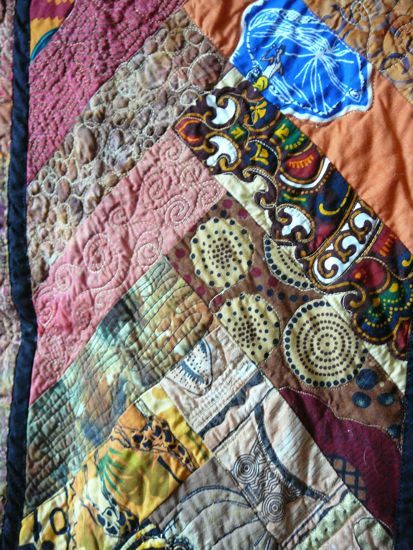 Wonderful quilt of African fabrics, some of which I recognize. What is this pattern ? Do you start with a square ? I love your work. Good ideas, Momcat. I want to try it again, one day. Isothreadsoflife – Glad you like it. It is French braid, I didn’t have a pattern, but I cut all the pieces same size as rectangles and started with a triangle as a base. You line up the first rectangle top with the far end of the triangle and stitch, then the second rectangle goes on the opposite side, and you alternate. Then when you reach the length you wish, you cut off the edges – or that is what I did. There is probably a more scientific way of doing it, LOL! Thanks a lot for explaining, I will try to do it too. I love it. 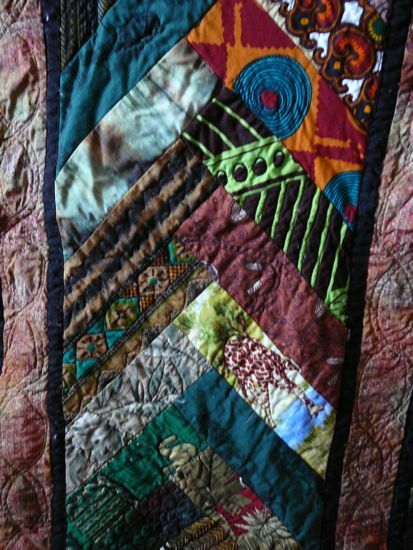 The fabrics are great and I like the quilting stitches. Wish it was mine! LOL.